Ivette Alvarez was born May 1, 2000. Since that day her mother has said that she has the soul of a 70 year old Italian man. She enjoys the deli and complains about the sun. Ivette grew up in the island that is known as East Boston (Eastie). She enjoyed a moderately fun childhood, playing both scrabble and softball. She watched a lot of television, enough to say that she was raised by her mother and the T.V. In the early years of her education, Ivette would often find herself intrigued by history and words. She enjoyed reading one story in particular, The Adventures of Tom Sawyer by Mark Twain. She was so impressed by the clever plot, that when asked by her third grade teacher who she would like to be when she grew up, she replied that she wanted to be Mark Twain. That answer remains true to this very day. Ivette always had an interest in impacting people through her use of words. Public service became a way for her to use her knowledge of and interest in communication to help make good progress in her community, the country and the world. 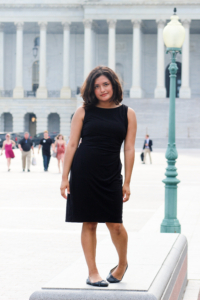 This summer, Ivette will work for Congressman Joseph Patrick Kennedy III. She holds a strong believe that her participation in the Ward Fellowship will allow her to meet important figures in government, where she will learn how she can catalyze change for future generations.